Wittenberg freshman Kathryn Combs, Wittenberg sophomore Hannah Eley and Tiffin’s Nicole Berry share a moment at the recent Tiffleberg Invitational track and field event. DARKE COUNTY – Three Darke County high school alumni now competing in track and field at the college level recently met at the Tiffleberg Invitational, a meet held in Tiffin, Ohio where both Tiffin University and Heidelberg University call home. 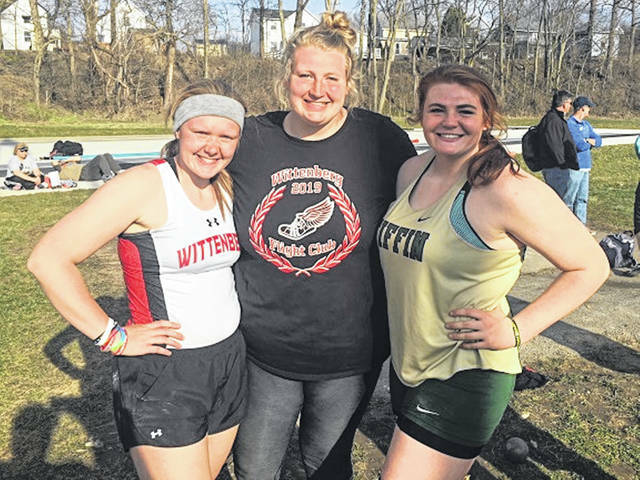 Nicole Berry and Hannah Eley, graduates of Franklin Monroe High School and Kathryn Combs, a graduate of Tri-Village High School recently met on the Campus of Heidelberg University to compete in the well know Tiffelberg Invitational. Berry competes for the Division II Tiffin University track and field team while Eley and Combs compete at Springfield’s Wittenberg University, a Division III school. Both Combs and Eley have qualified to compete in the All-Ohio Meets for the 2019 indoor and outdoor track and field seasons. College weight throw is an indoor event while discus and hammer throw are outdoor events and shot put is both indoor and outdoor events. Combs in her first year competing at the college level comes in with a best at 34’4” in the shot put, 106’3” in the hammer throw, 110’4” in discus and 35’8.75” in the weight throw. Eley, now in her second year competing at the college level owns a 51’1” Wittenberg school record in the weight throw and has a best of 144’5” in hammer, 112’2” in the discus. Although no longer able to compete in the shot put, the former Jet had a best of 34’6.25. “I need to sit more,” Eley said of where she can improve. “I stand too much when I throw. Discus is coming along; it was a little rocky to start the year. Berry, a High School All-American, 2nd Team NCAA All-American and now a redshirt freshman has been as high as No. 2 in the Nation for DII schools with a 51’3.75 throw in the shot put, a Tiffin University indoor record and she also has the Tiffin outdoor shot put record as well with a throw of 51’.75”. Berry has also thrown 148’5” in the hammer throw, 150’3” in discus and 48’4.25” in the weight throw. The three Darke County natives each agree, meeting former teammates and competitors at the college level is pretty special. “It’s a fun time and I’m glad we are all excelling at what we do and that we are able to talk each other,” Eley said. https://www.dailyadvocate.com/wp-content/uploads/sites/34/2019/04/web1_Kathryn-Combs-Hannah-Eley-Nicole-Berry-28481-.jpgWittenberg freshman Kathryn Combs, Wittenberg sophomore Hannah Eley and Tiffin’s Nicole Berry share a moment at the recent Tiffleberg Invitational track and field event.